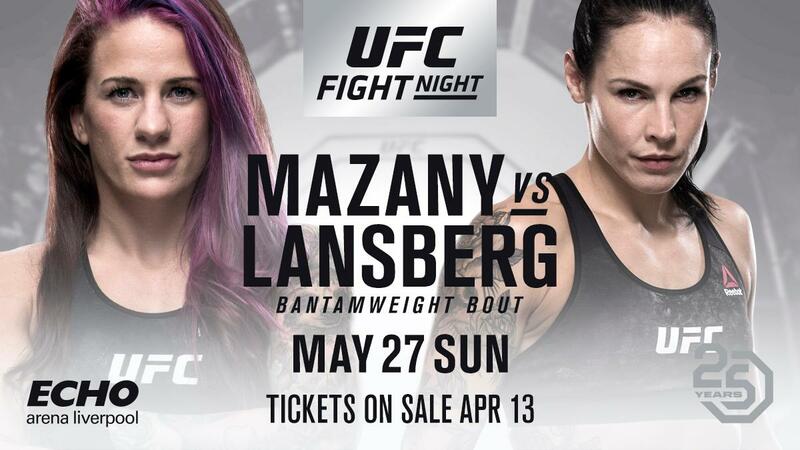 Last week it was reported by MMANYTT that Gina Mazany vs Lina Lansberg has been added to UFC Fight Night 130 May 27 at the Echo Arena in Liverpool, England. This fight was confirmed this morning by the UFC Europe Twitter feed. 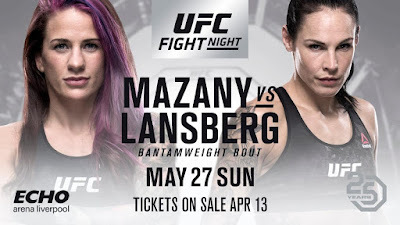 As I have said recently, with retirements, fighters dropping to Flyweight and some fighters aging fast, the UFC Women's Bantamweight division needs fresh blood. I don't believe either fighter belongs in the UFC. Gina is 29 years old originally from Anchorage, Alaska but she now trains at Xtreme Couture in Las Vegas. Her record is 5-1 and 1-1 in the UFC. After losing a TUF 18 qualifying match, I guess the UFC kept track of her. Because when they needed a late replacement for a Feb. 2016 match vs Sara McMann, she stepped up and got submitted in round one. She won her second fight in Nov. in China. Her brother Dave Mazany is the EFC Lightweight Champion and both are pro wrestlers. Sometimes they work as a tag team. Lina Lansberg is 36 years old from Malmo, Sweden. She trains with former UFC fighter Akira Corassani. Her record is 7-3 and 1-2 in the UFC. She came to the UFC as a sacrificial lamb to Cris Cyborg. She lost her most recent fight by submission to hot prospect Aspen Ladd. Lina is a kickboxer. She has no ground game. If Gina can take her down, she should be able to submit her. But as I said, I don't think either of them are very good so this could also be three rounds of blah.